Too many Afghans are being left stranded, at serious risk. The Special Immigrant Visa (SIV) is a U.S. program established for Afghan or Iraqi translators who have worked with the U.S. military. Translators play a crucial role for the U.S. military, and the Iraqi Refugee Assistance project estimates that around 50,000 Iraqi and Afghan nationals have served as translators over the past decade. However, working with the U.S. often comes with a heavy cost: being branded a “traitor” by the Taliban and other groups, putting the translators and their family members at constant risk. The SIV program was intended to provide protection against this by allowing the translators and their families to migrate to the U.S. after their service. Unfortunately, the program has fallen short, as evidenced by a recent protest held by Afghan translators outside the U.S. embassy in Kabul, demanding that the U.S. follow through with its promised visas. Obtaining a visa under the SIV program entails a lengthy, and costly, application process. There are three steps. First, the applicant must file a petition with the United States Citizenship and Immigration Services in the Department of Homeland Security (USCIS). The applicant is required to provide basic information, a birth certificate, with certified English translation, proof of employment with the U.S, evidence of a background check, and a letter of recommendation. If that is approved, the translator may move on to step 2, applying for the visa. This requires submitting many of the same documents, plus additional information for every family member. The entire process can – and often does – take years. After this is approved, the translators will move on to step 3, an interview with the U.S. Embassy. Some are held back by the medical clearances that are part of step 2, which require the translator to pay $500 per family member at Kabul’s only approved clinic. Since the medical approval comes with an expiration date, if it expires before the visa is issued, the translator must undergo the process again, which means an additional $500 per family member. In an attempt to fix this problem, the U.S. State Department has issued temporary visas that are valid for the time remaining on the approved medical clearance, even if it is just a couple of days. This means that the translator and his/her family have to pack and be ready to leave the country on very short notice. According to U.S. Department of State statistics, during the fiscal year of 2011, just three visas were issued to Afghani translators employed by the U.S. In 2012, that number only rose to 63. The program’s poor performance prompted Secretary of State John Kerry to review the process, with the result that the number of visa issued increased dramatically, to 3,441 in fiscal 2014. Still, while the number of applicants is difficult to obtain, in July this year 6,000 Afghan translators were reportedly stranded in various stages of the lengthy and complicated application process. One reason civil servants might be wary about issuing visas is that they do not want to be associated with allowing potential security risks into the U.S. However, many of the soldiers who served alongside the translators disagree with the notion of any potential security risk. 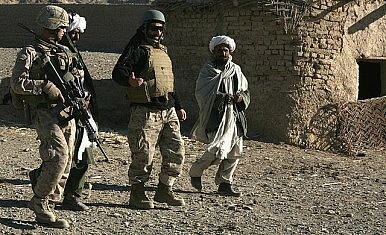 Indeed, U.S. soldiers have campaigned for a more efficient visa approval process, including U.S. Army soldier Matt Zeller, who has revealed that during his time in Afghanistan the Taliban would attempt to have the translators dismissed by calling and making fraudulent claims to the U.S. military bases in Afghanistan. Congress has just extended the SIV program for another two years, after it was set to expire on December 31, 2014. The extension is likely to assist thousands of Afghans. However, as American troops start to pull out, the translators and their families who are being left behind remain at serious risk of retribution from the Taliban. Without China's buy-in, any attempt to mediate between Afghanistan and Pakistan is doomed.